China is set to carry out its 28th orbital mission of 2018 with the launch of a pair of Beidou positioning, navigation and timing satellites from the Xichang Satellite Launch Centre on Monday, October 15. The two Beidou-3 satellites will be launched by an enhanced Long March 3B launch vehicle using a Yuanzheng-1 upper stage for direct insertion into medium Earth orbits. An airspace closure notice issued on Thursday indicates the launch, from Xichang in southwest China, will take place between 04:05 and 04:42 universal time on October 15 (12:05-12:42 local, 00:05-00:42 Eastern). The satellites will be the 39th and 40th launched as part of China's Beidou system, following the launch of the first in 2000. The Beidou-3 satellites are based on a satellite bus that features a phased array antenna for navigation signals and a laser retroreflector with a launch mass 1,014 kg, according to NasaSpaceFlight. The completed system of 35 operational Beidou satellites will have 27 satellites in MEO at around 22,000 km altitude, five in geostationary orbit and three more in inclined geosynchronous orbits, at 35,786 km, providing global GNSS coverage with a positioning accuracy of 2.5 metres. With 27 launches so far in 2018, China has already passed its previous record for launches in a calendar year of 22, set in 2016. 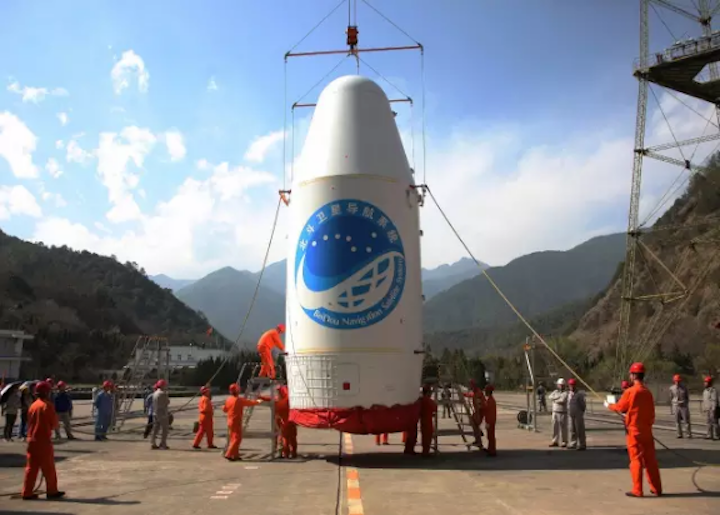 The main contractor for China's space programme stated at the start of 2018 it intends to launch up to 35 times this year. China is still planning two more launches of Beidou satellites this year using the Long March 3B rocket following the upcoming Monday mission. The same launch vehicle will be used to launch the ground-breaking Chang'e-4 lunar far side landing and roving mission in December. Any issue with any of these launches will likely delay the launch of Chang'e-4.